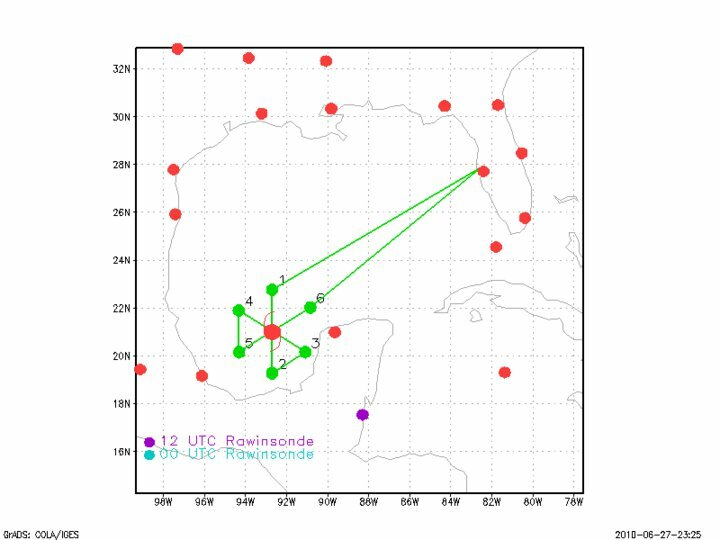 The P-3 is tasked by EMC to carry out a TDR mission into Tropical Storm Alex in the Bay of Campeche. The aircraft will depart MacDill AFB, FL at 20:00 UTC fly a butterfly pattern with 105-nm legs at 12000 ft to obtain radar data for EMC, and arrive back at MacDill by 04:00 UTC the next day. The P-3 was tasked by EMC to carry out a TDR mission into Tropical Storm Alex in the Bay of Campeche. The aircraft departed MacDill AFB, FL at 21:10 UTC. Successful ferry to initial point where a sonde was dropped. At that point, the number one engine started vibrating and was turned off. The aircraft and crew returned to MacDill by 02:24 UTC the next day. Only one bag was taken to Tampa since only one aircraft (42) was being used. When the first mission was canceled, the bag was not transferred to the other crew. Recommendation - each crew have its own bag. Two mac laptops were installed without testing to make sure they worked on the network. Xchat was not set up. No printing was available from laptops. Recommendation -system administrator test all network compatibility and software (printing, xchat, ftp, internet, etc.) when installing laptops on 43 later in the season. System administrator also should set up printing capabilities on current laptops on 42. Workstation trackball was broken. Recommendation - system administrator make sure trackball works when installing workstation. The SFMR was down at beginning of flight, and AOC techs thought it was down for duration. They fixed it near the end of the flight. Centrifugal switch on Engine 4 had a problem delaying takeoff for an hour. The aircraft ran out of water early in the flight. Recommendation - crew brings water on each flight. ASDL communications from workstation were down, but fixed with new cord late in the flight. There are currently no communications between AVAPS and workstation. Drops were put on thumb drives, transferred to a mac, then ftped to workstation. Radar started late due to problems during ferry. It later worked. A bug was found in initial step of radar processing test due to not finding radius of maximum winds. Data tech was unaware that they were to record packet data and that HRD was to take radar tape at end of flight. Recommendation -make a list of what the HRD crew should remove from the aircraft at the end of each flight. Make sure that AOC is aware of this list and adds the various steps to their checklist. Engine number 1 started vibrating and was turned off, ending mission just after dropwindsonde release.